Viralheat has been publishing some fascinating uses of it social media marketing and analytics software. For example, Viralheat has been analyzing the social media dynamics of some of the fall’s most-promoted TV network shows. Their research team compared the number of fans (Facebook likes and Twitter followers) for six highly promoted shows, and examined the volume of social media mentions for each show across all social media channels. The analysis uses Viralheat’s powerful sentiment analysis technology to determine whether the social media chatter for each show is positive or negative. This is a terrific example of something Viralheat calls "predictive social analytics" — applying natural-language processing technology to large-scale social media chatter to determine intention. Viralheat sees many ways that this technique can be used, and certainly the entertainment and advertising industries are two excellent candidates. But what if we looked at other brands that same person talks about on social media — could that help us develop a more accurate 'brand persona" of that individual? As you'll see below, we can: aggregated data for thousands of fans of a TV show can provide insights into the brand affinity profile for that show. 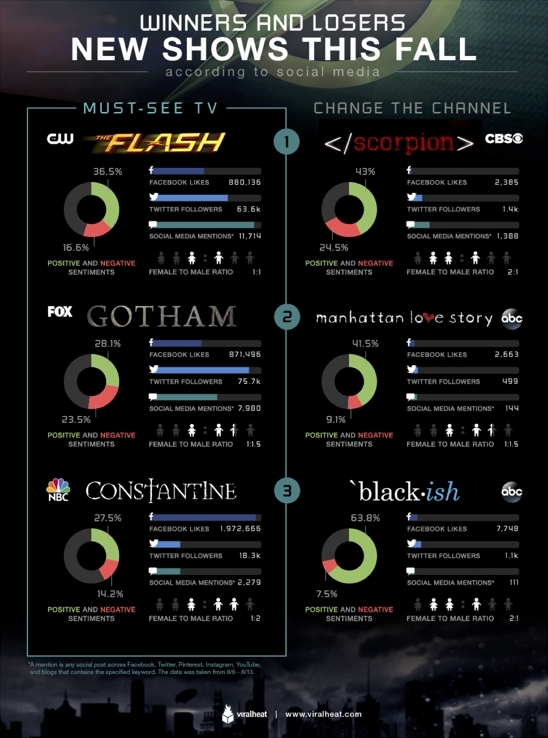 In fact, the brand affinity profile of Flash viewers is quite different than that of Gotham viewers. We think information like this could be very useful for brand managers, agencies and media planners — and of course for network executives. Aggregated data for thousands of fans of a TV show can provide insights into the brand affinity profile for that show. In fact, the brand affinity profile of Flash viewers is quite different than that of Gotham viewers. Viralheat thinks information like this could be very useful for brand managers, agencies and media planners — and of course for network executives. This appeared in the November 14 issue of Adweek.